Understand the Laws of the game better! Teach and role model for better and more positive behavior from players, coaches, parents and fans. Have fun - and did we mention earning extra $$$$$$$'s ! Assignments are available for Tournaments, Club matches, Recreational games and Adult league. Annual certification training sessions are held locally in the spring in conjunction with web based testing. Licensing through the United States Soccer Federation. Want to be a Referee ? Take and pass the on-line course. Attend and complete the classroom and or filed training session(s). There are two referee accounts required: Montana Game Officials and Got Soccer. Montana Game Officials is for course work/training and GotSoccer is for assignments. The FIFA rulebook is available with the test on Montana Game Officials and above on this web page. On the Montana Game Officials site, create an account, pay the fee and take the on-line test for the Helena area. After succesfully completion of the on-line test, attend the classroom/field training sessions. After successful completion of the on-line and classroom/field training, a grade 8 referee certification is issued. 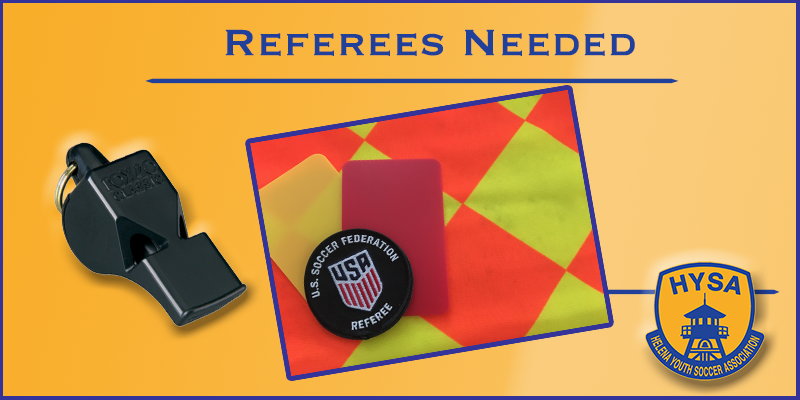 You will then need to create a GotSoccer referee account with your USSF ID# issued after completion of the training. Through GotSoccer, a referee is available to be assigned by any assignor they choose. This is for competitive club matches. Most Tournaments also use GotSoccer so sign up for Tournaments as they become available. Log-in to your existing account or if new choose the New User tab on the left. Be sure to choose the courses offered by the Helena referee trainer. For referees with 3 years or less experience, the classroom and field training session dates will be announced. The fee is paid on-line at registration. - attend the field session when the weather allows use of a dry flat space outside, probably in late March. Classroom / Fieldwork participants should bring a lunch, snack, drinks. Location of classes to be determined and will be announced. Enroll now and get to work on the latest on-line modules ! Boasting some of the best referees in the State! We are proud to announce the accomplishments of our locally trained soccer referees Cannon Colegrove Grade 8 and Gezer Garcia da Silva Grade 7 being named Officials of the Year for the State of Montana. Scott Lockwood reports, " Not only do we have the best players and complex but some of the best referees in the state! " Mark Beckman, the Executive Director of the Montana High School Association, recently announced the 2017 National Federation of State High School Association (NFHS) Officials of the Year for the State of Montana. Nominees for this award must exemplify the highest standards of ethical conduct, moral character and carry the endorsement of their respective state high school association. The Montana Officials Association (MOA) and the Montana High School Association (MHSA) are proud to have these officials included in that group.